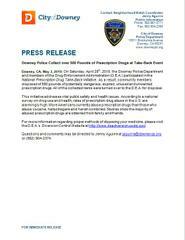 Downey, CA, May 3, 2018: On Saturday, April 28th, 2018, the Downey Police Department and members of the Drug Enforcement Administration (D.E.A.) participated in the National Prescription Drug Take-Back Initiative. As a result, community members disposed of 590 pounds of potentially dangerous, expired, unused and unwanted prescription drugs. All of the collected items were turned over to the D.E.A. for disposal. This initiative addresses vital public safety and health issues. According to a national survey on drug use and health, rates of prescription drug abuse in the U.S. are alarmingly high. More Americans currently abuse prescription drugs than those who abuse cocaine, hallucinogens and heroin combined. Studies show the majority of abused prescription drugs are obtained from family and friends. For more information regarding proper methods of disposing your medicine, please visit the D.E.A.’s Diversion Control Website at http://www.deadiversion.usdoj.gov/. Questions and comments may be directed to Jenny Aguirre at jaguirre@downeyca.org or (562) 904-2374.